Whatever you do, don’t lift the lid from that toilet over there! Wait wait wait…back up…”It’s a good thing I landed on those spikes before you did?” Is that the Iron Head, or Skull, or whatever? Did he land on said spikes head first, his ferrous noggin of power protecting the rest of his squishy body? Is that why he’s still, I don’t know, walking around? Yes! Notice the ‘damage’ Iron Skull’s suit took! What obvious? I would never have imagined that was a door! Yes, that’s “Iron Skull”. I believe they quickly migrated the iron to the rest of him too so he could be super. I just loved that all three things being said were super obvious. 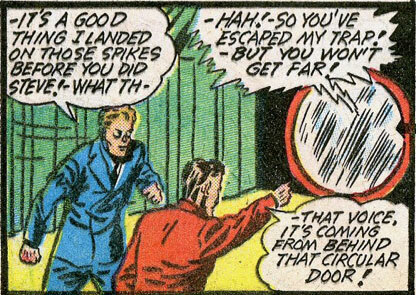 Yes, it’s a good thing the guy made out of iron landed on the spikes first. Duh. Yes, they escaped, since you’re looking at them. Duh. And yes, the voice is coming from over there, where you hear it coming from. Duh. Tal you’re right, it’s not obvious that’s a door, and so Brown Suit Guy wins the battle of wits!